At this time of geo-political conflicts and controversies, an emerging genre of independent films seeks to fulfill a new mandate of elevating film artistry and surfacing relevant issues, especially for the youth. A full length feature film to hit the major cinemas starting May 24, “Ang Araw Sa Likod Mo” is a values-imbued film with an arresting tagline “Bawa’t Paninindigan, May Kapalit.” (Every conviction demands a sacrifice). An award-winning advocacy film, “Ang Araw sa Likod Mo”, written and directed by Dominic P. Nuesa, is an action-filled story of two brothers reunited despite being separated by conflicting beliefs, and the sacrifices of Filipino soldiers, in the thick of the decades-old war against terrorism. It stars a talented, award-winning cast that includes Ping Medina, Bong Cabrera and Mike Liwag. The film is notable in its research-based authenticity, and its handling of the delicate subject of the raging controversy in southern Mindanao, a very timely theme. It heightens awareness of the issues while taking great care not to polarize the audience. 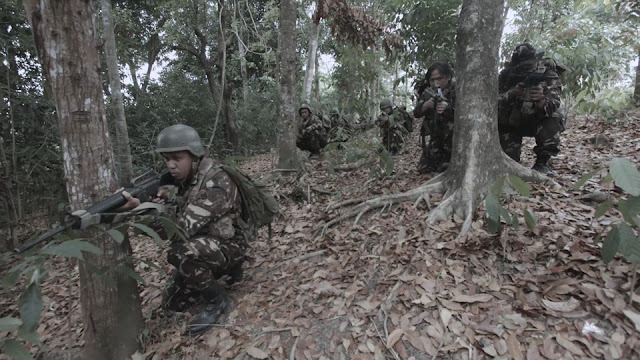 Inspired by the real stories of Special Operations soldiers in the country known as the Philippine Scout Rangers, “Ang Araw sa Likod Mo” is an intense film that introduces brothers Jamiluddin (Cabrera) and Omar (Liwag) along with Sgt. Benjie Calayan (Medina) within the terrorist infested island in Southern Philippines. “Ang Araw sa Likod Mo” (The Sun Behind You) is also nominated in the prestigious week-long Nice International Awards (2017) this year in the most coveted categories such as Best Director – Dominic Carlo P. Nuesa, Best Lead Actor – Mike Liwag, Best Supporting Actor – Ping Medina, Best Editing – Javier Abola and Best Sound – Greg Rodriguez III. Produced by independent outfit An Earth Below Productions, “Ang Araw sa Likod Mo” has already won five international awards – Best Film in Auckland International Film Festival, Global Award Winner at the Europe-based ARFF (Around Films International Film Festival), and Awards of Recognition for Feature Length, Best Actor (Bong Cabrera) and Best Supporting Actor (Mike Liwag) at the Accolade Global Film Competition in the United States. The film is a tribute to heroism and sacrifice, and challenges us to be more knowledgeable and understanding when trying to make sense of violence and national security. Fighting for a cause, or making a stand, one eventually must sacrifice something and ultimately asks if it was worth it.